The conference will be held on March 22 from 9 a.m. to 3:15 p.m.
Southwest Minnesota State University is getting down to the bigger and more serious issues that are still a big part of today’s society. 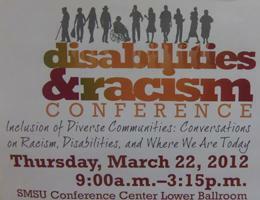 A Disabilities and Racism Conference will be held on March 22 in the lower ballroom of the Conference Center. The conference will be held from 9 a.m. to 3:15 p.m. This conference started in 2005 and was held annually through 2008. The conference has not been held since and has started up again this year. “Because discrimination and racism toward people of color and people with disabilities continues, the conference has always aimed…to highlight the fact that this discrimination, however subtle, exists,” Ted Stamp, SMSU graduate, said. The event will include four speakers. The speakers are Mahmoud El-Kati (professor emeritus of history at Macalester College in St. Paul), Renee Hogoboom (associate director of diversity and equity division of the Minnesota State College and Universities (MnSCU) system), Scott Goings (assistant general counsel for MnScu) and Sedric McClure (multicultural counselor in the Academic Excellence Center at Macalester College). “We wanted people who would be effective instruments in dispelling some of the myths associated with the issues of discrimination and racism with respect to people of color and people with disabilities…That is the primary focus,” Stamp said. This event will cover these two particular issues and will give the audience insight into how these issues are still affecting society today. The focus is only on a portion of the community that is discriminated against because of their race or a disability. There are still many other forms of discrimination in society today. This event is sponsored by Southwestern Center for Independent Living, the Office of Diversity & Inclusion; Disability Services; and Access, Opportunity, Success.